Doors open at 4:45 p.m. Doors open at 4:15 p.m.
WPSA Board Member Amy Mlot provided excellent testimony to the Joint Finance Committee about the critical need to address the direct care workforce crisis at the Oak Creek public hearing on the state budget bill. There are two Joint Finance Public Hearings Left! WPSA needs YOU to Testify at a Joint Finance Public Hearing on the State Budget! Governor Evers’ proposed state budget increases the Medicaid personal care rate by 1.5% per year, but an 11% increase is needed to prevent the collapse of Wisconsin’s community-based direct care provider network. WPSA needs your help to educate lawmakers about the critical need to address the workforce crisis. The Joint Finance Committee—the Legislature’s budget-writing committee—is holding public hearings on the budget during the month of April. It is very important that they hear real stories from providers, workers and clients about how the crisis is impacting people in their everyday lives. If you are interested in speaking at a public hearing, please contact the WPSA Board! WPSA’s budget talking points document and tips for testifying before the Joint Finance Committee can be found on the Legislative Resource page! Senator Patrick Testin (R-Stevens Point) has introduced Senate Bill 126, which creates a new $1,000 family caregiver tax credit. The proposal would allow individuals who provide care to their family members to get reimbursed for some caregiving expenses. Qualified expenses could include: employing a home care aide or personal care attendant ,making improvements or alternations to a residence to help with accessibility and mobility; purchasing or leasing equipment; adult day care, specialized transportation, legal or financial services, or assistive care technology. DHS is holding a forum on electronic visit verification (EVV) implementation on April 10, 2019 starting at 10 a.m. in Milwaukee. You can attend in-person or online. The forum will be livestreamed for anyone who cannot make it to the forum in person. Viewers can submit questions before and during the presentation via the EVV mailbox: DHSEVV@dhs.wisconsin.gov. 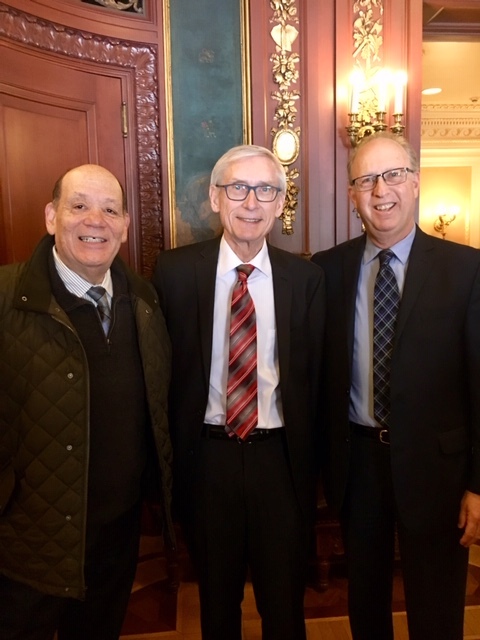 Governor Evers introduced his 2019-21 state budget on February 28. It includes several major investments in Medicaid, including a 1.5% per year increase to personal care rates and accepting federal funds to expand Medicaid. Family Care Direct Care Funding: Provides an additional $14.7 million per year to increase the direct care and services portion of the capitation rates the department provides to managed care organizations in recognition of the direct caregiver workforce challenges facing the state. This increase would bring total funding for the program to approximately $90 million for the biennium. Nursing Homes Rates: Increases nursing homes and ICF-IIDs rates by 1.5% per year for direct care staff; and an additional 1% per year for acuity of patients. Governor Evers has released an executive order to create a Governor’s Task Force on Caregiving. Membership of the task force has not been established yet, but the order says that the task force shall include: members of the Legislature, at least one provider agency, at least one organization providing respite services, at least one person who receives caregiving services, and at least one individuals who provides caregiving services. · Establishing one or more registries of home care providers and developing a plan to provide referral and matching or matching services for individuals in need of home care. · Exploring and developing solutions, in collaboration with other relevant departments and agencies, to support and strengthen the direct care workforce, increase access, and improve the quality of caregiving in Wisconsin. WPSA Legislative Chair Todd Costello and WPSA Government Relations Counselor Michael Blumenfeld attended the signing of the Executive Order creating the Governor’s Task Force on Caregiving. Governor Walker signed the three extraordinary session bills passed by the legislature into law today. While Walker had previously said he was considering possible vetoes, he signed all of the bills into law as passed by the Legislature. The bills limit early voting to two weeks, create new legislative oversight of executive branch functions, place limits on the Attorney General’s ability to withdraw the state from lawsuits, create a process for the Legislature to intervene is certain lawsuits, and put the new work and cost-sharing requirements for childless adults on BadgerCare into law. There are several specific changes that may be of interest to WPSA. Requires Joint Finance Committee (JFC) passive review of any Medicaid rate increases, supplemental provider payments or state plan amendments that have a fiscal impact of more than $7.5 million. Creates a new waiver renewal and request process that includes strict legislative oversight. These changes will impact Family Care, IRIS, BadgerCare and other health and long-term care programs which are run using waivers. DHS may not submit a request to a federal agency for a waiver or a renewal, modification, withdrawal, suspension, or termination of a waiver unless legislation has been passed specifically directing the submission of the waiver. At least 9 months before a waiver expires, DHS must submit a written notice to JFC of the expiration. If DHS intends to request substantive changes to the waiver, they must use the legislative oversight process created by the bill. This includes submitting a waiver implementation plan to the Joint Finance Committee, submitting the proposed waiver request to JFC for approval before submitting it to the federal government, required bi-weekly contact with the federal agency negotiating the waiver request, progress reports to JFC on the negotiation process and JFC approval of the final negotiated waiver before it can take effect. If JFC determines that DHS has not made sufficient progress with a waiver request, they can reduce DHS’s administrative funding or staffing levels. Creates new standards related to agency guidance documents, which the bill defines as “any formal or official document or communication issued by an agency, including a manual, handbook, directive, or informational bulletin” that explains the agency’s implementation of a statute or rule or offers guidance or advice on how the agency is likely to apply a statute or rule. It requires state agencies to cite the relevant state or federal statutory reference or administrative code in any guidance documents they release. Proposed guidance documents must be posted for public comment before they can be adopted. Once the guidance document is finalized, it must remain on the agency's website as long as it is in effect. It also prohibits agencies from seeking deference in a legal action based on their interpretation of any law. Updates the current law process that allows the Joint Committee for Review of Administrative rules to suspend an administrative rule to clarify that the Committee can initiate the process to suspend a rule multiple times. Governor-elect Tony Evers is holding budget listening sessions over the next 7 days to hear from Wisconsinites about their top priorities. WPSA needs your help to make sure that Gov.-elect Evers addresses the direct care workforce crisis in his state budget. Sign up to attend one of the listening sessions with Governor-elect Evers below and get your personal care workers and consumers to sign up too! Big turnout is critical to having our voices heard. You can use the WPSA legislative priorities to help guide your talking points and turn in other written materials. You must register to attend these listening sessions. Dec. 18 in La Crosse: Noon to 1:30 p.m. at American Legion Post 52, 711 6th St. South. Register at https://bit.ly/2EamsSE . Wisconsin is facing a critical shortage of personal care workers due to chronic underfunding of our long-term care system. 1 out of 2 agencies surveyed by WPSA are considering no longer providing Medicaid personal care services. The Medicaid personal care reimbursement rate of $16.73 per hour is about $2.00 below the actual cost of providing care. Rates must be increased by at least 11% to make agencies whole. The direct care workforce crisis is threatening the health, safety and independence of people with disabilities and frail elders. Please convene a direct care workforce task force devoted to finding solutions to the worker shortage. Share any stories you can about how the crisis is impacting your clients (for example, people sleeping in wheelchairs overnight, falls, hospitalizations, etc.). There are two upcoming opportunities to provide input into the implementation of Electronic Visit Verification (EVV) for personal care. Policymakers need to hear from you about how EVV will impact agencies and consumers. Please considering attending one of these upcoming forums to voice your concerns. The Federal Centers for Medicare and Medicaid Services is holding a national conference call to get feedback on EVV on November 7 from 12 p.m.-2 p.m. CST (1 p.m. Eastern Time). DHS is holding a forum to provide information and get feedback from stakeholders about Wisconsin’s plans to implement EVV on November 27 from 10 to 11:30 a.m. (CST) at the Stevens Point Holiday Inn Hotel and Conference Center, 1001 Amber Avenue, Stevens Point, WI. The forum will also be live-streamed for those who can’t make it to Stevens Point. DRW and the Wisconsin Disability Vote Coalition have developed an “FAQ” document with some of the most common questions we receive about the November 6th Election, and brief responses. We encourage you to review this document, which includes some of the basics about voting in Wisconsin, as well as information about disability related accommodations and voting rights. Congress has voted to provide $300,000 to help fund implementation of the RAISE Family Caregivers Act. This will help fund the creation of a national Family Caregiving Advisory Council charged with developing a family caregiving strategy. The Strategy must recommend actions that Federal, State, and local governments, communities, health care providers, long-term services and supports providers, and others are taking, or may take, to recognize and support family caregivers in a manner that reflects their diverse needs. The Advisory Council would consist of the following appointed members: Family caregivers, older adults with long-term services and supports needs; individuals with disabilities; health care and social service providers; long-term services and supports providers; employers; paraprofessional workers; state and local officials; accreditation bodies; veterans; other experts and advocacy organizations. Many federal and state offices are up for re-election in November 2018. This includes one U.S. Senate seat, all Congressional seats, Governor, Lt. Governor, Attorney General, every member of the State Assembly and State Senators from odd-numbered districts. While the national and statewide races get the most media coverage, it is just as important to educate yourself on races for State Assembly and State Senate. The Department of Health Services has released their agency budget request for 2019-21, which can be viewed here: https://doa.wi.gov/budget/SBO/2019-21%20435%20DHS%20Budget%20Request.pdf. These requests help the Governor prepare the state budget, which will be introduced in January or February of 2019. DHS is requesting a cost-to-continue budget for Medicaid, which is an additional $496 million GPR for the biennium. Part of this is to reflect increased long-term care costs due to statewide expansion of Family Care. DHS also requests an increase for administrative costs, which they say includes EVV for personal care in addition to increased administrative costs from FoodShare and Medicaid work requirements and other federal requirements. Interestingly, DHS is projecting fee-for-service decreases in intensity/use for personal care, private duty nursing and home health (likely due to Family Care/managed care expansion) but increased fee-for-service costs for hospitalizations and prescription drugs. DHS also projects that nursing facility patient days will decline by 5.0% annually in Fiscal Year (FY)19, FY20 and FY21. o Eliminating the waiting list for the Children’s Long Term Support Program, children continue to enroll. In addition, DHS must implement a statewide rate schedule. o Phase-out of the enhanced federal matching for CHIP will begin in this biennium. However, standard FMAP is projected to increase while CHIP FMAP decreases. President Trump signed H.R. 6042, which delays financial penalties for EVV until 2020, into law yesterday. CMS must also hold one public meeting in 2018 to get feedback on the EVV guidance they issued in May. Take the DHS Provider Survey on EVV Implementation! DHS has developed a survey to gather provider feedback about electronic visit verification (EVV) for personal care. Input from providers is essential to the planning process for the EVV requirement. Results from this survey will be used by DHS to help plan for the implementation of the EVV requirement. Please complete the following survey by August 6, 2018 by clicking on the link below. The survey should take about 5–10 minutes to complete. If you have any questions or comments regarding EVV, please contact us at DHSEVV@dhs.wisconsin.gov. U.S. Senate Passes EVV Delay Legislation! The U.S. Senate voted unanimously yesterday to pass H.R. 6042, which delays penalties associated with EVV until 2020! It now goes to the President for his signature. Wisconsin's projected Medicaid surplus continues to grow. DHS now projects that Wisconsin will end the 2017-19 biennium with a $102.4 million GPR surplus in the Medicaid budget. They attribute this to lower BadgerCare enrollment, lower nursing home utilization (but higher personal care expenditures) and updated prescription drug cost estimates. The U.S. House acted on a voice vote Tuesday to pass H.R. 6042, which delays EVV financial penalties by 1 year and sets forth some standards about stakeholder input. Specifically, it requires CMS to hold at least one public meeting in 2018 to get feedback from Medicaid stakeholders on the EVV guidance they issued on May 16, 2018. This bill was introduced on June 7 by Congressman Brett Guthrie and is slightly different from the bill authored by Senator Lisa Murkowski. During brief debate on the bill, Congressman Guthrie talked about how EVV is important for program integrity and that OIG has warned of fraud in personal care. He said the delay is needed to make sure that EVV is implemented effectively and that they have received feedback that more time is needed. The U.S. Senate will now need to vote on this version of the bill before it becomes law. Contract Senators Ron Johnson and Tammy Baldwin and ask them to support this legislation! Ask Candidates About Their Plans for Solving the Workforce Crisis! Election season is upon us again in Wisconsin! The statewide primary will be held August 14 and the general election is on November 6. Please attend candidate forums, listening sessions or engage candidates in conversation if you see them at community events this summer. 1. What steps will you take to address the direct care worker crisis that is being driven by inadequate Medicaid reimbursement rates? 2. How will you ensure that Wisconsin’s long-term care system has an adequate provider network that guarantees access to care in the community? 3. Do you support continued funding of the $25 million of state funds provided to Family Care providers in the last state budget to help support direct care workers?